Punch-Out!! Wii featuring Don Flamenco? The stalwart heroes over at GoNintendo are reporting that the new issue of Game Informer will have some juicy new details on the upcoming Wii release of Punch-Out!!. Chief among these is the revelation that Don Flamenco from Mike Tyson's Punch-Out!! will be making an appearance in the game. No word on whether or not you'll be able to defeat him in your first meeting with alternating jabs but his toupee is reportedly going to be returning. 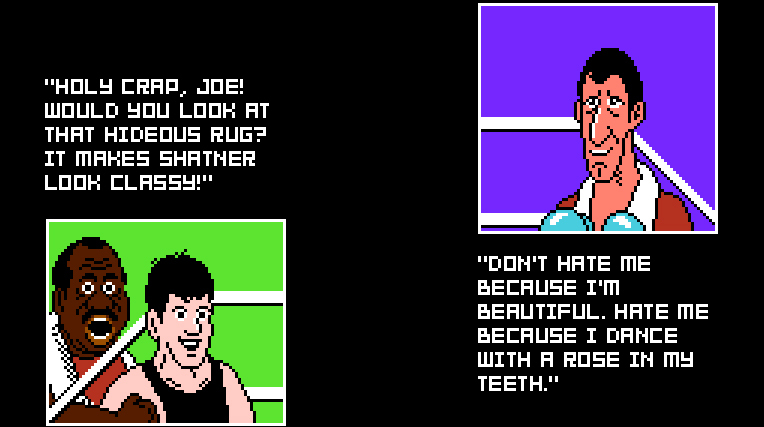 Another character slated to take up the gloves again is Bear Hugger, the grizzly-looking redneck who boxed the ears of many a player in Super Punch-Out!!. The memorable expression he makes when punched in his indestructible gut (which always makes me think of Deliverance for some reason) will be present. This means that I'm going to have nightmares for a little while but it'll be worth it. Now, while I'm quite clearly all about the nostalgia thing, it's worth noting that we haven't heard about a single more than one new character in this game. Everybody we've either seen or heard about to this point has been in the series previously (except Disco Kid). So, where are the new characters? Will players (this means you people) be satisfied with an updated game using a roster consisting entirely of boxers we've seen before?